Our nurturing and experienced staff is passionate about young children and highly trained. Our head teachers are certified through either the International (AMI) or American Montessori Society (AMS). Head teachers have one assistant, many of whom also have a Bachelor’s degree, childcare experience or have completed their Montessori training. Our teachers enjoy what they do and are devoted to creating a respectful and caring learning environment for all Bala House preschool and kindergarten students.
) Kiernan has a BA in Communications and Psychology from Rutgers University and received her AMS certification from the New England Montessori Training Center. Kiernan joined Bala House in 2008 after teaching at Riverside Montessori in New York and Cambridge Montessori School in Cambridge, MA. She is the mother of a Bala House graduate.
) Mary Beth is an AMS certified Montessori teacher with over 12 years teaching experience. She obtained a B.S. in Early Childhood Education / Creative Arts from East Stroudsburg University and a M.Ed. plus Montessori certification from Chestnut Hill College. Mary Beth joined Bala House in 2014 after working as a head start Montessori teacher in the Philadelphia School District. She also has many years experience in singing and visual arts. Mary Beth is the mother of a Bala House graduate.
) Jamila has a M. Ed. in Early Childhood / Special Education from New York University and her Montessori certification from Chestnut Hill College. She has been teaching at Bala House since 2014. Denise Williams, Extended Care Director: Denise has been at Bala House since 1980. She has training in Play Therapy from Hahnemann Hospital and an Early Childhood Education degree from Harcum College. Denise is the mother of two Bala House graduates.
) Hong has a Master’s degree in Sciences of Education from the University Lumiere Lyon-II in France and her B.A. in French language and Literature from Shanghai International Studies University in China. Her Montessori Certification is from Chestnut Hill College. She is a Pennsylvania State Certified teacher and is fluent in Chinese and French. Hong is familiar with the Bala House community as a parent and as an Extended Care assistant from 2010 ~ 2013.Hong also completed her Montessori internship at Bala House. She returned to Bala House in 2014 as a head teacher. Hong is the mother of two Bala House graduates. Carolyn Blackwell, Chryselle Bolger, Gayle Malaika Davis, Lisa Hickman, Danielle Klaiman, Tynesia McDowell (Late Care Supervisor for Extended Care), Tonie Rhinehart, Jessie Sauer, Nancy Andrews, and Soraya Force, Assistants: Carolyn joined Bala House in 2007 with 9 years of childcare experience. Chryselle, a doctoral student at Penn, came in 2010 and is the mother of two Bala House graduates. In 2014, Malaika began working at Bala House. She is a PA certified N-3rd grade teacher with a B.S. 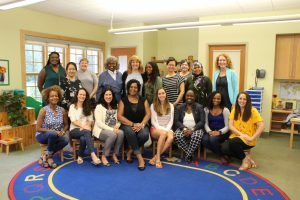 in Child Development and Child Care from the University of Pittsburgh who appreciates the self-directed, peaceful Montessori Education program. Lisa joined our staff in 1997 and is a mother of a Bala House graduate. Danielle began teaching at Bala House in 2012 with extensive childcare experience. She is a graduate of Chestnut Hill’s Montessori Certification Program. Tynesia is a graduate of Penn State University College of Human Development and joined our team in 2013. Toni started at Bala House as a substitute in 2011 and became an assistant in 2013. She has over 20 years experience with children in daycare and recreational programs, and is the mother of a Bala House graduate. Jessie began interning at Bala House in 2014. In 2015, she received her Montessori certification from Chestnut Hill College. Linda Betlejeski, Music Instructor: Linda joined the Bala House staff in 1990. She holds a B.S. in Music Education and a M.M. in Music Education Research from Temple University. Since 1981, she has taught at various area schools. Dana Calafati, Tumble Tots owner and Movement Instructor: Dana attended the Exercise & Sports Science program at Ursinus College. She has 16 years of gymnastics experience and 14 years of direct gymnastics teaching experience with both nursery and school-age children. Dana joined Bala House in 1999. Lisa Dissinger, Ph.D., Consulting Psychologist: Lisa is a licensed psychologist in private practice with a specialty in early childhood development and parenting coaching. Her consulting practice includes psychological assessments of children, consultation to parents, and parent education. Lisa is the mother of one Bala House graduate. Ashley Coenen, Art Instructor: Ashley joined the Bala House staff in 2017 after previously working as a long term substitute art teacher with us. A fine artist, she holds a BFA in 2D Fine Arts from Moore College of Art and Design and a MAT in Art Education from University of the Arts. Ashley has been teaching art since 2007, and has taught for the Philadelphia Mural Arts Program, Fleisher Art Memorial, and AIM Academy. She also teaches at Nether Providence Elementary School. Ana Levit, Kindergarten Spanish Teacher: Ana has taught Spanish to our kindergarteners since 2001. A native speaker of Spanish, she holds a B.S. in Early Childhood Education and has had Montessori training at Chestnut Hill College. She is the mother of four Bala House graduates.
) Diane joined Bala House in June 1998. She has experience in both Early Childhood Development and Administration. She holds a M.C.A.T. (Masters of Creative Arts Therapy) in Dance Therapy from Hahnemann University and has over 15 years experience in Administration, both in the legal profession and at Bala House as the Assistant Director for 6 years. Diane is the mother of two Bala House graduates.
) Lina holds a BA in Art from the University of California, Los Angeles. She joined Bala House as our Administrative Assistant in 2014. An avid water sport enthusiast, Lina was a two time member of the US National Dragon Boat Team, Senior Women A and competed in Ravenna, Italy with her dragon boat club crew, Philadelphia Flying Phoenix. She is the mother of two Bala House graduates.
) Yael is a Bala House graduate who has loved math ever since learning to count in Janet & Claire’s class using the math chains designed by Maria Montessori. She has studied advanced accounting and finance at Albright College, holds a degree in Business Management from the University of Phoenix, and has 6 years’ experience in finance and office management. She officially joined the Bala House administration team in 2013.
) Emily holds BS in French from Georgetown University and has served as Admissions Director in a variety of schools. As a parent of two Bala House graduates, Emily brings her love of Montessori and the unique Bala House community to her position. Emily served as the Development Chair for the Bala House Board for three years prior to joining the Bala House staff in 2015.